The traditional art of the Gond tribe of central India has achieved global recognition and is selling at high prices. The basement of S-67 Panchsheel Park, New Delhi, packs a surprise. A cat meows and runs away to hide behind a chair. But it is hardly the most interesting animal in the room. There are flying elephants, deer with striped, tiger-like skin, a pig with a face on its belly, gigantic fish, cows that blend into trees, snakes that merge into birds. These are all on paintings that hang on the walls. The basement is home to Must Art Gallery and it mostly showcases Gond art - the art of the Gond tribe of central India, dwelling mostly in Madhya Pradesh and Chhattisgarh. They were originally painted on the walls in Gond villages, with motifs ranging from imaginary animals to deities, fauna and flora. The art form - with a distinctive style which uses characteristic patterns such as dots, ovals and fish scales, among others - was nearly lost during the Mughal era and British rule thereafter. It started making a comeback in the 1980s after Jagdish Swaminathan, the former head of Bharat Bhavan, the arts complex in Bhopal, discovered Jangarh Singh Shyam, a Gond artist whose experimental work was to earn him international recognition. There has been a mushrooming of artists from the community since, and in the last few years, many of their works have been bought by well-known Indian and global collectors. The appreciating value of their work is, perhaps, the best testament to its strong revival. Rajendra Shyam, 39, exhibited his work at Nottingham's New Art Exchange Gallery in 2009 and at the Horniman Art Gallery in London in 2011. "Gond art has become popular," he says. "An A-4 size painting now sells for Rs 2,000 to Rs 5,000. Ten years back, it used to sell for Rs 150 to Rs 200." According to a Must Art Gallery spokesperson, the price of works by artists such as Narmada Prasad Tekam has appreciated steeply. "The minimum reserve price for an auction of one of Tekam's paintings in 2012 was Rs 60,000. It sold at triple the price," she says. Another artist, Mayank Shyam, has seen a three-fold increase in his painting's price in the last decade, she added. His larger canvases can sell for Rs 2.5 lakh. Rising prices of Gond art have helped tribal artists vastly improve their quality of life. "The artists have now bought cars, sofas, large TVs. 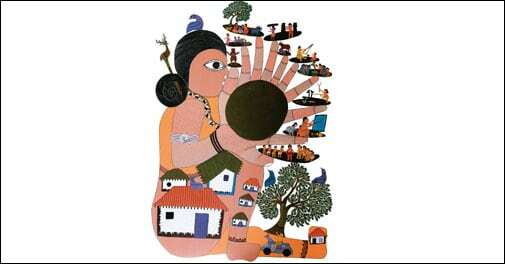 Their children are going to better schools," says Padmaja Srivastava, a tribal art promoter in Bhopal. Srivastava runs an online Gond art gallery and is trying to promote Gond artists internationally too. While galleries such as hers have popularised Gond art, e-commerce is now making it accessible to international collectors. "There is demand from the US and Europe. 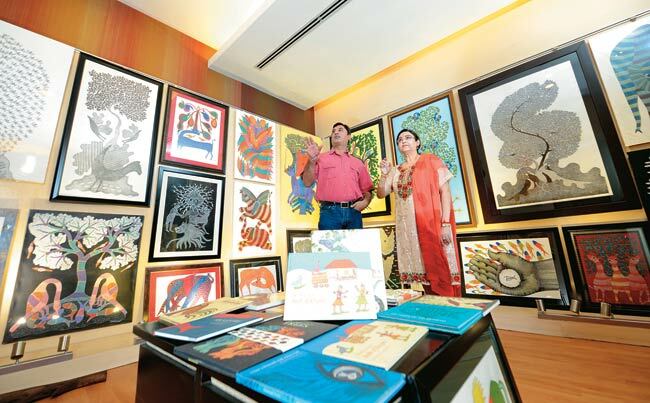 Gond art buying has picked up as corporate gifts for overseas clients," says the Must Art Gallery spokesperson. Some experts attribute the art's revival to its evolution. While motifs such as imaginary animals and nature still dominate the Gond world, there are artists who are providing a new twist. Artist Vekat Raman Singh Shyam, for instance, exhibited a 'Smoking Taj' at the SakahÃ n International Indigenous Art exhibition at the National Gallery of Canada this year. It was his take on the 26/11 terrorist attack at Mumbai's Taj Mahal Palace hotel. Slowly but surely, Gond art is assimilating the contemporary.